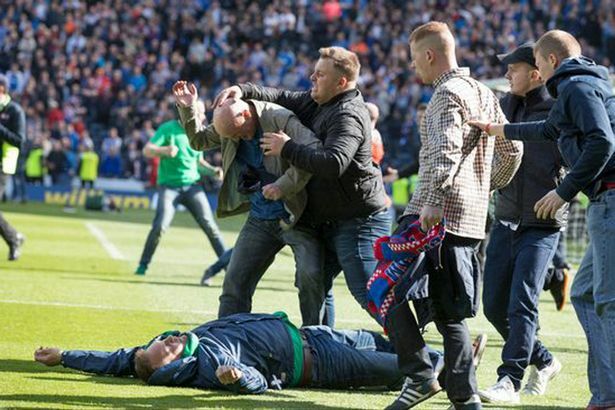 The 2016 Scottish Cup Final was marred by the bad conduct of a large section of Rangers supporters who, throughout the match baited Hibernian fans with sectarian chants The songs (clearly audible to television viewers) contained the phrases ‘Fenian bastards’ and ‘up to our knees in Fenian blood’. Despite the foregoing the game was played in a good spirit by both teams and the final result was in the balance up to the final minute when Hibs scored the winning goal. At the final whistle (seconds after the restart) a number of Hibs fans invaded the pitch. They were mainly exuberant, but a few sought to re-enact the events of 1977, when Scotland beat England at Wembley. This brought Rangers supporters onto the pitch and the resultant confrontation was inevitable. Many watchers and television viewers were horrified at the violence between both sets of supporters and allocated blame equally between them. But not Prof Adam Tomkins. He made it clear, when writing to the Rangers Forum that the Scottish Tory Party absolved Rangers and their supporters of any blame. 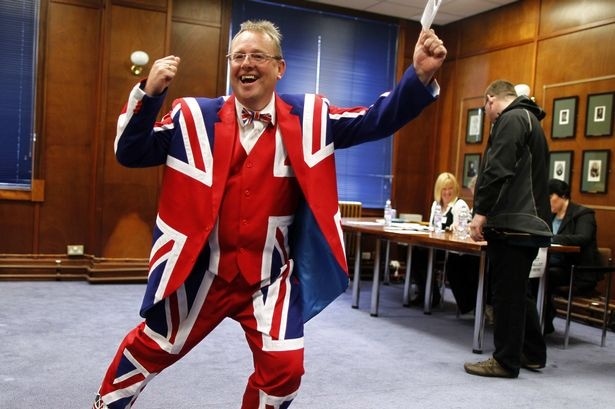 He then basked in the adulation of Rangers fans who commented favourably about the Tory party and Tompkins in particular. But a subsequent investigation, completed by Sheriff Principal Edward Bowen QC made it clear that there was fault on all sides and he could not attribute blame to either club or to any individual, or group. The comments made were: “Ms Sturgeon “condemns unreservedly any act of violence or disorder by anyone who attended the cup final”. “Violence has no place in football, either on or off the pitch,” Justice Secretary Michael Mathieson. The foregoing statements were vindicated by the later findings of Sheriff Principal Edward Bowen QC. Prof Adam Tomkins MSP comments were unbecoming of a member of the Scottish Parliament but, as yet no disciplinary action has been taken against him by his Party leader. Shame!!! Hibernian and Rangers escaped punishment by the football’s governing body in relation to the disorder at the Scottish Cup Final at Hampden. Hibs triumphed 3-2 to win the Scottish Cup but the post match celebrations were marred by scenes of crowd disorder and a pitch invasion. A report by Sheriff Principal Edward Bowen QC into the disorder said it was impossible to attribute blame to either Club or to any individual or group. He suggested a reserve of police should be ready to deal with possible pitch invasions in high profile matches and said new laws should be brought in to make pitch invasion a criminal offence. Events of 21 May and Follow up. I’m writing to hopefully discuss the disgusting scenes witnessed at Hampden yesterday. I would write to Nicola Sturgeon, but she’s already made it quite clear that she has no interest in condemning it, in fact, on the contrary. At the age of 29, and having attended hundreds of football matches at both Ibrox and Hampden, I’ve never seen scenes like yesterday. As a Rangers supporter, it’s safe to say I feared for my safety, and to watch Rangers player getting attacked was my worst moment as a Rangers fan. I appreciate there’s not a huge amount that can be done with the SNP in control, but I was curious to hear your thoughts on the matter, none the less, and hoped as the main opposition, you would be the best person to contact (I should mention I’m a local constituent). Any suggestions on what can be done to take the matter further would be greatly appreciated. I think I speak for the majority of Rangers fans when I say that we can’t accept what happened yesterday getting swept under the rug by the SNP. I was at the game: not on a corporate freebie but with Rangers season-ticket holders in the Rangers end. 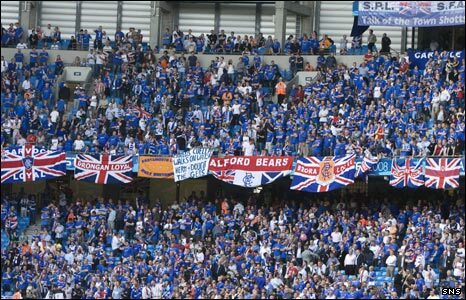 I used to be a season-ticket holder myself at Ibrox. * Why Hibs fans were allowed to reach Rangers players who were still on the field of play? * Why the police seemed (to me) to take quite a while to restore order? “The events after the final whistle at Hampden on Saturday ruined what should have been a day of celebration for the whole of Scottish football; not only the culmination of a long cup competition but the first time that two teams outside the top tier have competed in the final. While Hibs supporters will rightly wish to celebrate winning their first Scottish Cup in 114 years that can be no excuse for the reported assaults on players and officials, nor the destruction of the fabric of our national stadium. l understand that Police Scotland have set up a unit to track down the perpetrators, and I would urge them to ensure that all routes are taken to identify and charge those involved in these criminal acts. Thereafter, it will be for Parliament to determine how best to review the performance of Police Scotland in responding to this disorder. Can’t argue with that, its set the bar for other MSP’s to respond to similar questions with the same respect and attention to detail. Bravo Mr Tomkins, I actually trust this guy to do his best for us, most unusual for a politician. Thank you Mr.Tomkins and I trust that you will be vigilant when the SNP and Labour attempt to whitewash this affair. Excellent response but where are SNP and Labour in their condemnation of the events or even acknowledge them. Puts his party leader to shame. If this guy was in charge, they would get more votes. The problem with police Scotland the route they will be taking will be mostly directed at our support. One of the reasons why I voted Conservative for the first time in recent elections. That is the difference between a real political party and a shower of charlatans (SNP and Labour). Impressed with that response. Wee Nic is my constituency MSP. I emailed her. Still waiting. He was on one of my lecturers at uni. Full of his own self importance and loves the sound of his own voice however very committed to the union. Didn’t know he was a bear. That reply is very good. Hope he delivers. Good reply, I hope he shares it with his party leader. She could learn from Prof Tomkins. Just remember this is the result of voting Conservative in the Glasgow region. Far from a wasted vote. Just remember this is the result of voting Conservative in the Glasgow region. Far from a wasted vote. Correct, don’t give SNP or Labour your votes, they despise Gers fans. Puts his party leader to shame. If this guy was in charge, they would get more votes. She was too busy getting married. Don’t suppose she gave much thought to the game. Good reply. Fair play to him. Decent reply, hope he follows it up. Excellent response. I don’t know why we don’t vote more conservative in Scotland. SNP are fascist. Labour/liberals a joke. That is a good reply. Glad to see that we have someone our side. I was at the game (as I was in 1980) and Saturday was a lot worse. Best political response so far…..sadly maybe the only one. Saturdays troubles and concerns should transcend politics. Excellent reply from Mr Tomkins, it’s good to know we have a politician on our side, I may need some advice later. Just gained a vote for Tory next elections. Bravo to him, hopefully he keeps his word.